This post may contain affiliate links for your shopping convenience. All opinions are my own. Thank you for supporting House Full of Summer! 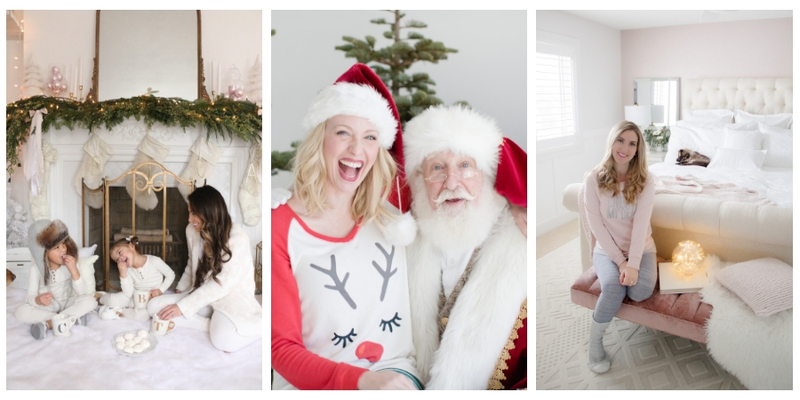 It’s the coziest time of the year, so I’ve linked up with a talented group of bloggers to bring you some great ideas for getting cozy this Christmas season! Come on in and join me for coffee in PJs! When you think of getting cozy, don’t warm, fuzzy blankets come to mind? I keep soft throws in all of the rooms because it does indeed get cold in northeast Florida! The other day I found these super soft and warm ballet style pom pom slippers at TJMaxx and I found some online and even a pair for matching “mommy and me” slippers! These keep my feet toasty and you’ll love how soft they are! Since cozy is the name of the game, I layered up with an oversized knit sweater cardigan and jogger pajama pants. The weather here can be really up and down and it’s typical to have freezing lows in the same week that highs are in the 70s. I suppose this is my Florida version of cozy winter pajamas! I still have a few gifts to wrap and I just had to show you the beautiful wrapping paper I found! It matches my decor this year perfectly. I sourced some similar gift wrap in neutral colors with metallic gold patterns below. The holidays can be a very busy time, but I hope you take a moment every day to put your feet up and just relax! You can get additional product sources linked up below, but don’t forget to hop over and see how 5 other bloggers make their Christmas mornings cozy!